Get instant savings by booking a Honningsvag travel package. Just select your favorite options and let Expedia do the rest. Secure your package deal on Expedia and save as much as C$590*. Our comprehensive database provides more than 400 partner airlines and 321,000 worldwide properties. With such a broad range to pick from, you really can't go wrong! It can be really nice to just stroll around the streets when you're in a new destination, but sometimes it's a good idea to have a plan in place. Grab your travel program — we have lots of wonderful ideas for your Honningsvag vacation. History is full of lessons. Drink in the knowledge and gain an insight into times past at North Cape Museum. Travelers are spoilt for choice in and around this destination. Forget your history books! See the past spring to life at Nordkappmuseet. Still got time on your hands? Discover exciting ideas and magnificent artwork at Gallery East of the Sun. It maintains a regularly changing schedule of exhibits that are sure to interest art buffs. Searching for somewhere to stay for your cheap vacation or luxury getaway in Honningsvag? It's advised you act quickly, as there are only 4 Expedia properties to select from. Begin your vacation on a fancy note by sliding between the soft sheets at the Scandic Bryggen (Vågen 1). Alternatively, the Nordkapp Vandrerhjem - Hostel (Kobbhullveien 10) is a great place for the budget-conscious traveler to get their forty winks. The airport is rarely the best part of your vacation, but there's nothing like the feeling of knowing that your trip to Honningsvag is just a plane trip away! Once the plane lands at Valan Airport (HVG), you'll be 2 miles (3 km) from the center of town. Notice the colorful backdrop of brightly painted buildings as you wander down a pier of this cruise port in northern Norway. Situated near the airport, this hotel is within 2 mi (3 km) of Honningsvag Port, North Cape Museum, and Honningsvag Stadium. North Cape is 20.1 mi (32.4 km) away. Situated near the airport, this hotel is within a 10-minute walk of Honningsvåg Church and Honningsvag Port. Honningsvag Stadium and North Cape Museum are also within 10 minutes. 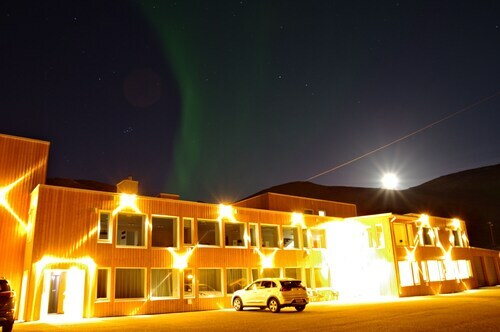 Located in the heart of Nordkapp, this hotel is steps from North Cape Museum and Honningsvag Port. Honningsvåg Church and Honningsvag Stadium are also within 15 minutes. 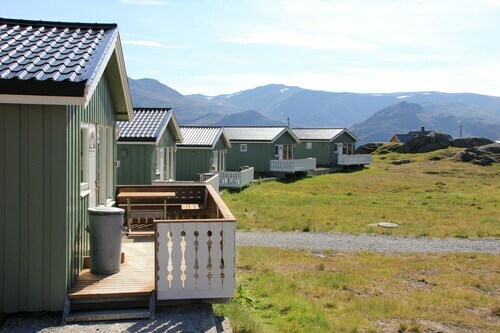 Situated in Nordkapp, this campground is within 6 mi (10 km) of Honningsvag Port, North Cape Museum, and Honningsvåg Church. Knivskjellodden and North Cape are also within 20 mi (32 km).